TrakInvest, through which investors can follow and learn from leading traders, is a platform that brings people from across the world together to buy and sell stocks, using $100,000 in virtual money that each of them is given in starting capital. Users then try to grow their virtual portfolio by using actual stockmarket information found on the site; not only do they get information in real time, they can also look at other traders' portfolios and learn from them. The contest was held from March 15 to April 15. The winners each won a Samsung Galaxy Note 8.0 tablet for growing their virtual portfolios most successfully. Koh Song Koon, a 51- year-old chief engineer turned stay-at-home father, attributes his win to reading The Business Times. He said: "Reading BT is my morning ritual. It helps to sum up markets and highlight stocks news and generate trading ideas. It has definitely helped me in winning this contest." 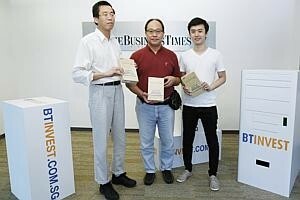 Fellow winner Alan Mah, a 39-year-old businessman, agreed: "The Business Times kept me abreast of corporate news, so that I knew which stock to buy." Around $150.6 million was traded by 1,200 unique users in the course of a week. Bobby Bhatia, chief executive of the three-month-old TrakInvest, was gratified by how the contest has been able to reach out and engage those interested in investing. He had set a modest goal of pulling in 500 participants for the contest, so the level of participation surprised him. "It was the highest level of engagement we'd ever seen," he said. The website, averaging 500-750 trades a day before the contest, has since moved up to 2,500 trades a day, he said. The third winner, NTU business student Andrew Toh, said that, as much as reading helps, getting real- life experience is also important, because there are factors that cannot be understood by reading alone. The 23-year-old started out the latest among the three winners but doubled his initial capital of $100,000 by aggressively trading and reading BT in the morning before the virtual markets opened. Mr Koh had nothing but praise for the website: "Well done, TrakInvest and BTInvest, for this virtual- trading platform to help budding traders and investors learn trading in real time, test their strategies and sharpen their overall trading skills and preserve their psychological well-being." Even though the contest has ended, you can still pit your trading skills against others by signing up at www.btinvest.com.sg/markets/trakinvest.